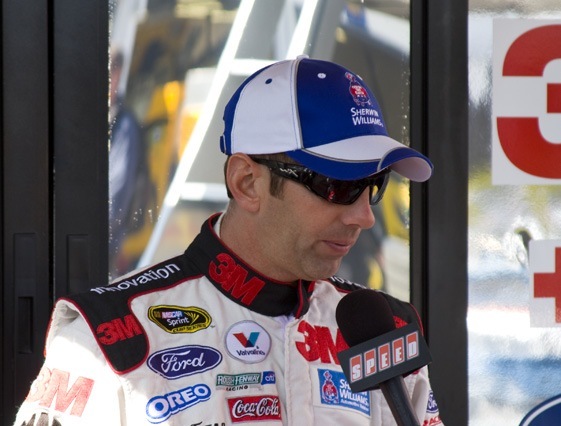 Kansas City, Kan. – In his post race press conference, Greg Biffle joked that he should have given crew chief Greg Erwin the one-finger salute as he pulled into his pit stall for his final stop of the Price Chopper 400 at Kansas Speedway. Instead, Biffle showed Erwin four fingers as he stuck his hand out the window, meaning he wanted his Roush Fenway Racing crew to put four tires on the car, and not two. That decision, for which Biffle took all the blame, may have cost him Sunday’s race. “I feel bad – at the end I wanted to take four tires and the crew chief wanted to take two, and I decided I wanted four. That was probably the wrong thing to do,” Biffle, who ended up third, said. Biffle and Erwin went back and forth over the two-way radio as soon as the caution flag came out – erasing Biffle’s 9-second lead. The debate was whether to take two or four tires, and Biffle made the last second call as he came to a stop. He had qualified 31st and got to the front thanks to some two tire pit stops, and led a total of six times for 113 laps. The two-tire pit stops allowed Biffle to stay up front because it seemed impossible for times for cars at the front of the field to pass each other. “I think (pit strategy has played a role) all year, and I think it’s going to continue because these cars really like to be up front. The guy behind you has a big disadvantage in air. Even though the track is really wide, your car has to work in that lane. I caught Dale Jr. running three-tenths, four-tenths of a lap faster and just stalled out. I couldn’t do anything because he was running the line I was running, and I couldn’t really run anywhere else,” Biffle said. And because Biffle took four, he was at the wrong end of that aero-disadvantage, because the three cars that restarted ahead of him on the final restart took two. “So, at one point late in the race there, I looked like we were going to have his thing won fairly easily, depending on how the cautions fell,” Biffle said. * Mathematically speaking, everyone in the Chase is still alive for the Sprint Cup title. Realistically speaking… well, given the results at Kansas, the herd has been thinned by four. Given the way that the drivers at the top of the Chase have run the first three weeks, everyone after Greg Biffle – who is in eighth place and 114 points behind leader Mark Martin, may be looking to 2010. Ninth-place Ryan Newman finished 22nd and is 164 points behind Martin. Carl Edwards finished 10th, but he’s a point behind Newman. Kasey Kahne finished sixth, but is still 190 points behind thanks to his engine misfortune at New Hampshire. In all, 10 of the top 11 drivers were Chasers. Brian Vickers has the longest odds of all of them, now 250 points back thanks to engine woes at Kansas. But even without engine trouble, Vickers was in a world of hurt as soon as the green flag dropped. Surprisingly, given his speed at intermediate tracks in 2009, Vickers fell backwards from the start, and brought out a caution on lap 127 when he spun off of turn four. David Reutimann finished seventh and was the only driver outside of the Chase to finish in the top 10 Sunday. Reutimann started 13th and stayed near the front all day, consistently running in the back half of the top 10. “All in all it was a really good day. I had a good race car and the guys did a good job – pit stops were good,” Reutimann said. He also gained points on Kyle Busch, who finished 12th, for the battle for 13th and the $1 million bonus that comes with it. Reutimann now sits 105 points behind Busch in 15th. One driver who didn’t gain any ground on Busch was Matt Kenseth. Kenseth, who has run well at Kansas in the past, had a good car in the early stages of the race, but was forced to retire thanks to an engine that was like a ticking time bomb. “I think it’s not all the way blown up yet, but it’s getting set to, so we just quit before we killed the whole thing,” Kenseth, who finished 39th, said.